Creamy, delicious, and most of all EASY, this Keto Cheesy Broccoli & Cauliflower Rice is the perfect healthy low carb side dish! Made in just minutes, it’s great for those busy weeknights! When Mr. Hungry and I were first married many, many, MANY 😂 years ago, one of our “go to” side dishes was the little boxes of rice mix that were already flavored – so you just cooked the rice and added the seasoning packet. Mr. Hungry’s favorite was the broccoli and cheese, which was ironic because the man loathes broccoli like no one I’ve ever seen! To be fair, that neon orange colored rice with tiny flecks of green in it didn’t even come close to tasting like real broccoli, but I was just glad he would eat it and figured there had to be some vitamins in there somewhere…right? I haven’t made prepackaged rice in over 20 years, but had a flashback to the old days and decided to recreate it in this healthier version that had actual broccoli in it, and of course cauliflower to stand in for the carb heavy rice. This Keto Cheesy Broccoli & Cauliflower Rice is not only healthier than the boxed version, it also tastes SO. MUCH. BETTER. Boasting plenty of real cheddar cheese, it also has some mascarpone cheese stirred in, giving it a creamy, rich texture that is the best thing to happen to broccoli and cauliflower since….maybe ever. Because the veggies are chopped finely, this can get by picky kids and husbands whose main issue with vegetables is the texture. Depending on how long you cook it, it really does have the mouthfeel of cheesy rice – but you can cook it even longer if your tribe likes their veggies softer! 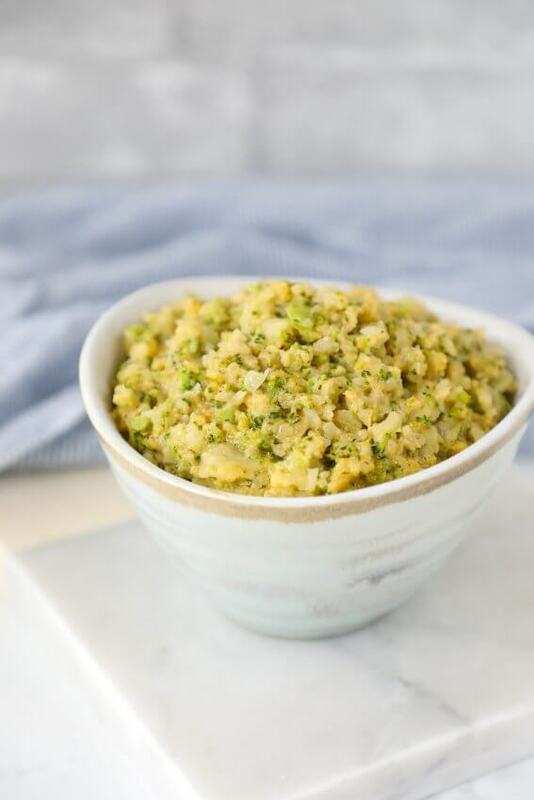 There is no end to what you can do with this Keto Cheesy Broccoli & Cauliflower Rice beyond just using it as a low carb side dish! Eat it plain, top it with a fried egg and call it breakfast, or throw in some cooked chicken and it becomes a one pot meal. 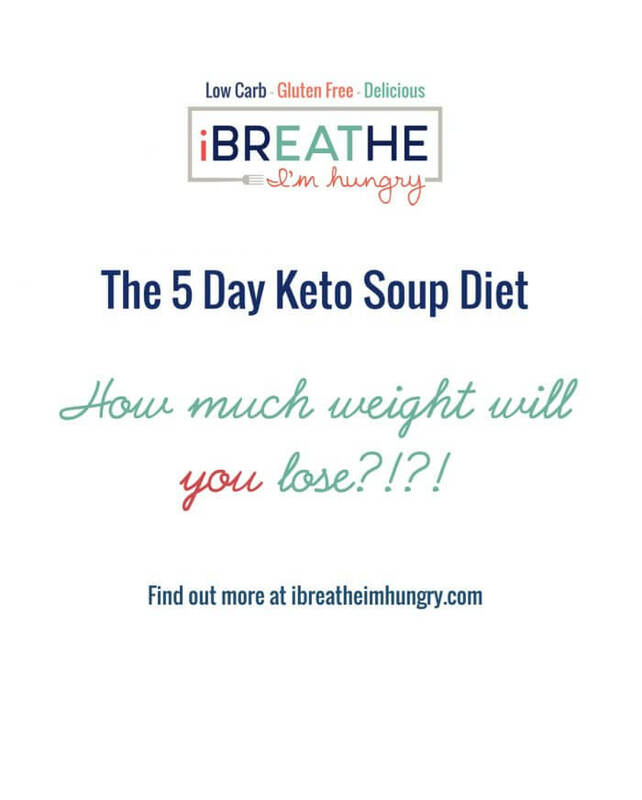 You can even puree it and add some heavy cream and chicken broth and you’ve got a tasty keto soup! 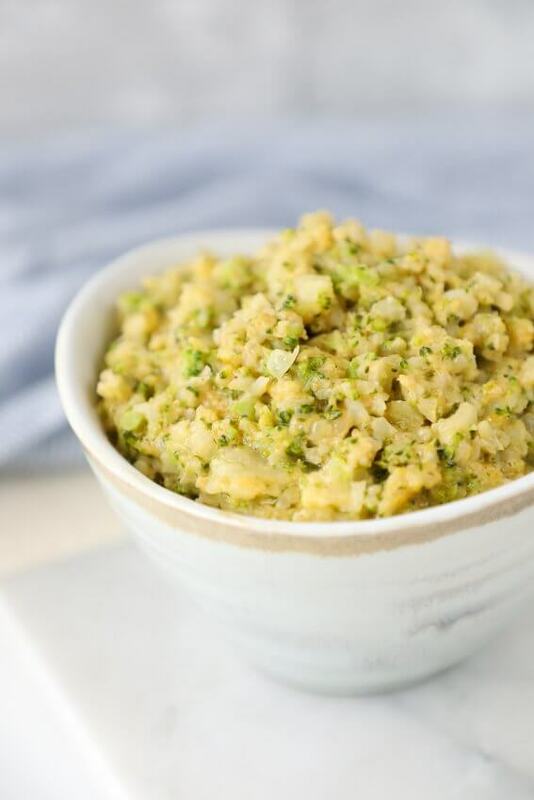 Seriously – the sky is the limit with this versatile Keto Cheesy Broccoli & Cauliflower Rice! If your family hates broccoli as much as my guys do, you don’t even have to add it – just replace the broccoli with extra cauliflower rice and you are in business. 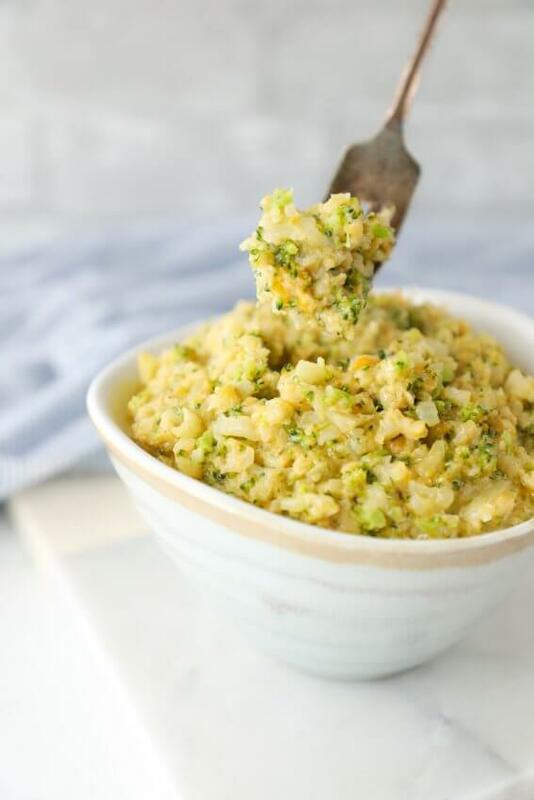 Creamy, delicious, and incredibly easy, this Keto Cheesy Broccoli & Cauliflower Rice makes the perfect low carb side dish! Combine the cauliflower, broccoli, butter, salt, pepper, garlic powder, and nutmeg in a medium sized microwave safe bowl and microwave on high for 4 minutes. Stir. Microwave for an additional 2 minutes. Stir. Add the cheddar cheese and microwave an additional 2 minutes. Remove from the microwave carefully and stir in the mascarpone cheese until creamy and fully incorporated. 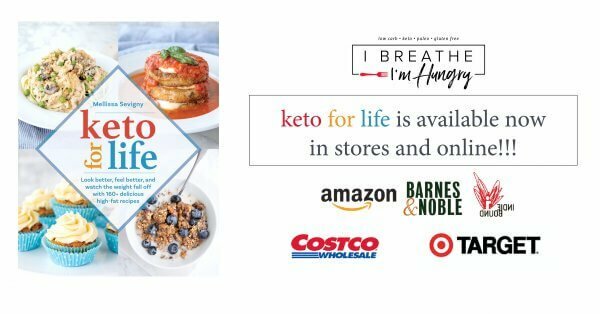 Net carbs per serving are 2g. 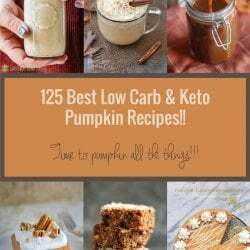 I never take the time to review recipes, but I absolutely had to for this one!! 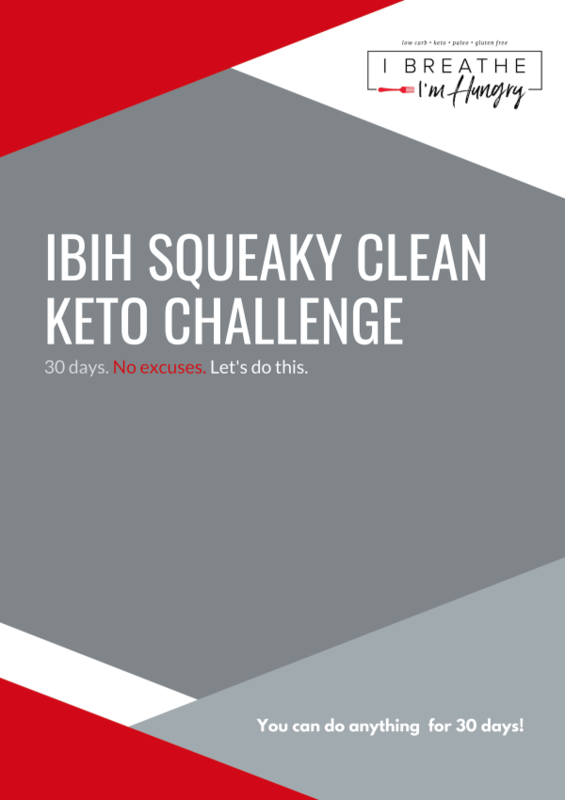 I have been following a Keto diet for almost 5 months now, and this recipe is hands-down THE BEST recipe I have tried so far!!!! It’s amazing!!! I am not a fan of cauliflower at all, but this dish tastes just like a rich, cheesy, fabulous bowl of cheesy rice!!! Thank you!!! Try it, you will not be disappointed. I made the dish exactly as written. I personally think the mascarpone cheese takes it to the next level. Loved this! I used ricotta because that’s what I had on hand and the dish turned out beautifully. 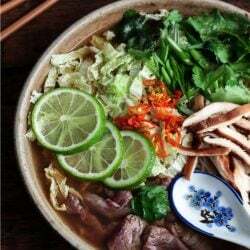 Just a big bowl of comfort food! So glad I found this recipe. I will be adding chicken and taking his to our church pot luck! 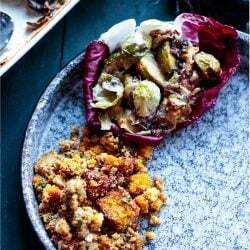 This is amazing – I make it a LOT as a main dish, honestly it’s so filling to me, I couldn’t eat it as a side dish. I love it, it doesn’t even really taste much of either veg, so creamy and cheesy, it is perfect comfort food. 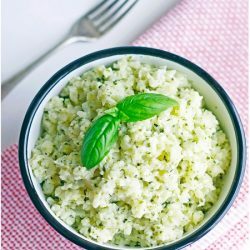 I should have added – I use as much riced broccoli as I do cauliflower and I use basic cream cheese in place of mascarpone. I eat this 2 or 3 times a week now and have recommended your recipe here to many others. I despise cauliflower. I hate the taste of it. . I poo-poo all the “cauliflower makes an excellent rice substitution!” Recipes. B.S. I’m sure I’ll taste it no matter how well it’s disguised. All that being said, I couldn’t resist picking up a bag of riced cauliflower at Aldi’s. I used it for this recipe…. I was prepared to be assaulted by the cauliflower flavor I can so readily pick out. Well done!! It’s as good as the old Velveeta Broccoli Cheese And Rice I was raised on! It goes perfectly with my steak! (I may have boosted the broccoli ratio, but still!! ) I’m going to stock up on this particular cauliflower! I freaking loved this cheesy dish! 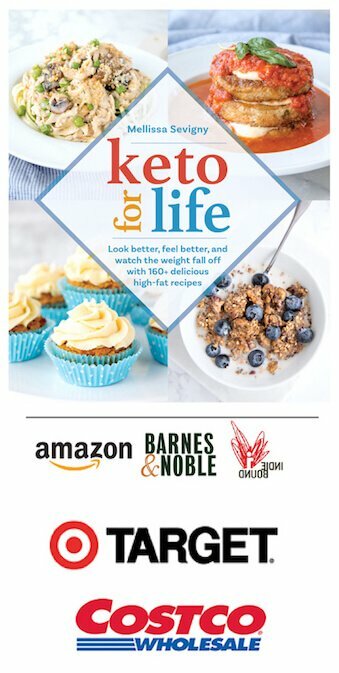 I started keto this week and your website has been invaluable to me. Thank you for all your hard work. I crumbled up a couple sun dried tomato feta meatballs in a bowl of this broccoli cheese “rice” & mixed up for lunch! Super yummy recipe!!! Sooooooooooooo good!!! I am a “wing it” kind of cook, so I used what I had. Omitted the nutmeg, used garlic powder and onion powder, a bit of ranch seasoning, omitted the salt, used more of both cheeses. I also do not have a microwave, and did this on the stove top in a skillet….this one is a keeper!! Also, my kindergartner said this was the best risotto ever. This is fantastic! Just used a bunch of leftovers from Super Bowl veggie trays! I didn’t have mascarpone so I used ricotta and I did put a little extra cheddar (mine wasn’t looking very yellow!). So very good. Also, the box grater worked fine for both cauliflower and broccoli. Going forward I would do as as others have and sub cream cheese for the mascarpone. Otherwise it’s awesome! Green Giant has a riced cauliflower broccoli blend so that you don’t have to buy each separately. I love cauliflower rice. I make this a lot except I prep my cauliflower rice in the oven. This Cheesey Broccoli and Cauliflower Rice casserole recipe looks delicious! 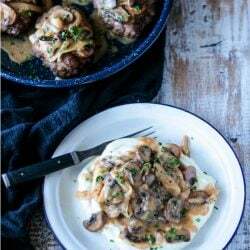 I make this with rice and I am happy to find one that looks this good with cauliflower! Can you post alternatives to microwaving in your recipes? (Don’t have one anymore). This looks delicious! Plus the fact that you mentioned you can make it and crack an egg on top and eat it for breakfast … mind blown! Who wouldn’t want basically low-carb mac and cheese for breakfast? YUM! 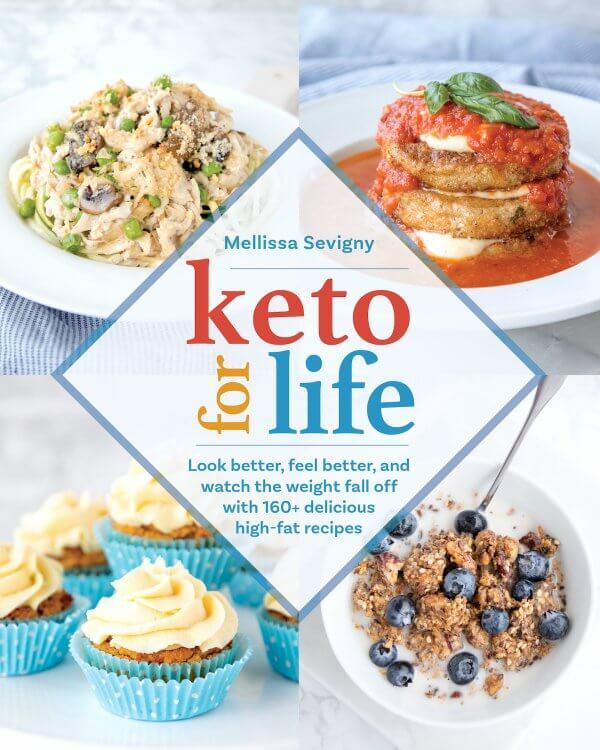 Thanks for the recipe Melissa! My five stars didn’t show up with my review, so I wanted to make sure the accolades were passed on correctly!!! This looks wonderful!! I’m curious though. Usually, when I cook with riced cauliflower, I get the best results to cook it, then wring out the excess water using a tea towel. 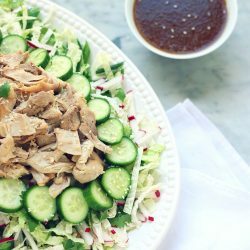 Does the excess water add to this recipe? This is fantastic!!! I didn’t measure my rice to cauliflower ratio, but I did measure 4 cups! I’m not big on using the microwave but I followed the recipe and it was fantastic!!! We were so pleased with the firm texture! I ended up adding more cheddar for our liking but we lived it and will definitely be making again!! This is delish! Thought I had only 1 C of riced broccoli but it kind of took over the cauliflower, turned it mostly green. Not that there is anything wrong with that but I wanted it to look more like rice so added another C of cauli-riice. Cooked it in a skillet for about 10-12 min and finished it by the recipe.A very easy, forgiving recipe and the mouth feel…mmmmm. I could have eaten it all but didn’t and that is a big deal for me! Oh, this looks great! Is it possible to sub cream cheese for the mascarpone? I’ve already done my shopping and don’t want to have to rent the Zipcar for just one item. I subbed with cream cheese, Erica. Do yuh buy your vegetables pre-riced, and if so, where? Or do you rice them in bulk? If so how? Can’t wait to try this! 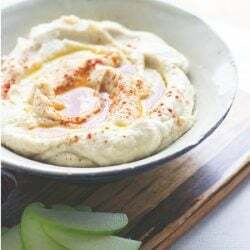 I do it in the blender with a method I learned from Big Red Kitchen years ago – You add the florets and fill the blender with water and then pulse and pour through a strainer. It’s the easiest way I’ve found and I always do it that way now! this looks delicious! silly question – do you rice broccoli the same way your ice cauliflower? Pretty much! You can do it in a blender or chop it finely with a knife – a grater may be harder because the florets aren’t as firm as cauliflower though! This is being added to this week’s meal plan. Alas, I don’t have a microwave and I have a bag of dried riced broccoli I am keen to use up so I will wing it and let you know how it goes! Looks Delicious Melissa!!! We also used to eat that seasoned rice you speak of but gave it up due to the gluten, sodium and preservatives. I’m sure that this is so much more yummy. Can’t wait to make this for my family. Hi Mellissa! This is a work of art – you owned me at nutmeg and mascarpone! I’d love to take this dish to my in-laws for Christmas dinner. How do you think it would travel best, if at all? In a crock pot? 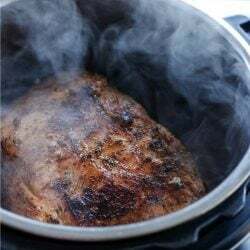 A quick reheat on the stove or in the oven? Microwave? I don’t want to take up their pre-assigned, valuable oven or stove space if possible. Any travel tips would be much appreciated! Thanks!